My original title for this was “The man-eating, attack, scare-the-crap-out-of-a-guy owl”. You’ll see why. This was my first year of hunting in a tree stand for deer. I purchased a two-seat model so I could place my backpack and gear beside me, but didn’t realize how heavy the stand would be. At around 75 lbs., it was a little too much for one person to carry but with two people it wasn’t bad. We had to carry it about ¼ mile to the tree I had picked out the year before. This tree was beside an area where I had come across a beautiful 4 x 4 buck the year previously, but, of course, it was a week past deer season; when I encountered it, I was hunting elk. We set the stand up with little problem. I realize now why the instructions say you should have three people for safety reasons. The stand is heavy and a little awkward, but we managed to put it together, tilt it up against the tree, and secure it. The stand seat sits about 15 feet off the ground, which was just fine with me. I know in some of the TV hunting videos they are up 30 feet or more, but that’s okay with me as my stand was just the right height to shoot from. The front of the seat also had a nice gun rest, so when a deer did walk by my rifle would be steady. I set in the stand the first day of mule deer hunting in Eastern Washington on Saturday October 15, 2011. The first day was uneventful (darn) but all went well. Early morning the next day, along came some camp robber birds I was watching over the side of the stand. Out of my right eye I noticed something as I turned quickly. 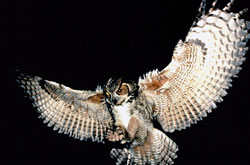 It was a Great Horned Owl flying right at me as fast as it could. Luckily I raised my arms across my face (and screamed like a little girl) just in time to see the owl put on the brakes and miss me by a few feet. If I hadn’t raised my arms or noticed the owl it would have sunk those big talons right into my face! I was told later that they have special feathers so they can fly stealthithy toward their prey. I did not hear it coming but sure did see the black of its eyes and those big talons ready to clamp onto me. I set in the stand the rest of the day and some time after that, but instead of looking and waiting for deer it seemed I was always looking in other trees to see if an owl would come down after me. I didn’t get the dream buck I was hoping for, but had a great hunting adventure. One strategy that works well for those who favor tree stands is setting up on a mineral lick. In the early season, heat is an issue. Mule deer, along with other ungulates, visit these licks on a regular basis. In my experience, as soon as the temperature drops and the leaves begin to fall, these licks can become less productive.